Toads + Clams | Eating well, with creative recipes, to follow the Fasting Lifestyle according to Michael Mosley's "Fast Diet." “Toads” of course are the delightful Toad-in-the-hole. And “Clams” stands for the stuffed clams which I just love. These meals are so fun and filling that you won’t believe that you are dieting! And yet they are right in line with the Fast Lifestyle which I have been espousing. You can eat like this and still get in shape! Come on! Join me! This whimsically-named meal is of old English origin – shades of Kenneth Graham and Beatrix Potter. The recipe is from the Fannie Farmer Cookbook. It begins with a Yorkshire Pudding batter which you need to prepare in advance. The Yorkshire Pudd recipe is from the King Arthur Flour 200th Anniversary Cookbook. Mix all the ingredients together and let the batter stand at room temp for 30-60 minutes or in ‘fridge overnight. You will need 1/3 cup of the batter per person. HINT: The remainder can be frozen in 1 cup or 2/3 cup or 1/3 cup batches for future meals. When it is time to use the batter, thaw it and beat it with a rotary beater until it is frothy. To prepare the breakfast: 1 breakfast sausage I like the Al Fresco brand chicken with sage @ 50 cal/link 1/3 cup Yorkshire Pudding batter, well beaten 1/4 cup berries or ½ of a pear 5-6 oz green smoothie or fruit smoothie or natural apple cider nearly-black coffee or tea or lemon in hot water. Heat the oven/toaster oven to 425. Cook the sausage, using a tiny bit of oil in the bottom of the pan since the sausage will render no fat. Cut the cooked sausage into a dice. Beat the batter until it is foamy. Spritz an 8-oz Pyrex custard cup with non-stick spray. Pour the frothy batter into the custard cup and mix the diced sausage in with it. Pop it into the oven for 15 minutes. 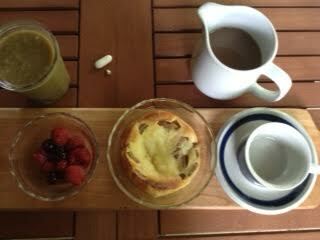 Slice the pear, shake your smoothie [if saved from last meal], brew your beverage, and feast. Cook the red pepper briefly in the water you will use for the vegetables later. Chop the pepper, dice the tomato, dice the meatballs. Prep the broccoli and carrots. Combine the first 7 ingredients and gently stir to combine. Heap into oven-proof dishes which have been lightly sprayed with cooking oil. Bake at 350 for 10 mins while the veg are cooking. 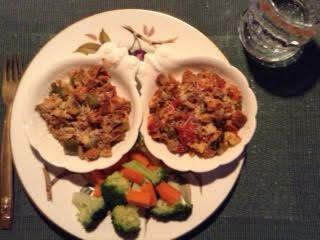 Sprinkle the cheese on the stuffed clams in the last minutes of baking.